How many times have you walked by someone on the street and tried to ignore their ranting and raving as you passed? Have you ever stopped to wonder why that person was yelling or ranting, or why they looked so disheveled, or what it was like to be inside their head? Probably not. It’s easier to simply grow a thick skin and walk by with a hardened heart. Having worked in downtown Edmonton for over a dozen years, I’m as guilty of this as anyone. This is why plays like Nicole Moeller’s newest work are important – they force us to face things we’d otherwise turn away from. The Preacher, the Princess and a Crow is Moeller’s fourth full-length play, following The Mothers (2015), An Almost Perfect Thing (2011) and Without You (2008). She’s built her reputation on penning scripts that delve deeply into very dark subject matter and this new one is no exception. Preacher is a production by Azimuth Theatre, under the direction of Murray Utas, who’s also co-artistic producer of Azimuth along with Kristi Hansen and Vanessa Sabourin. In short, Preacher tells the story of Jasper, a former street preacher who is trying to save the princess from a crow. Those aren’t fairytale characters, however, but rather characters in Jasper’s own life. As there’s a fairly substantial spoiler to ruin by delving too deeply into their identities, I’ll leave it at that. I’ve been mulling over the show for almost a week now. It was troubling, not least because it forces you to spend 90 minutes inside the mind of a very troubled individual. 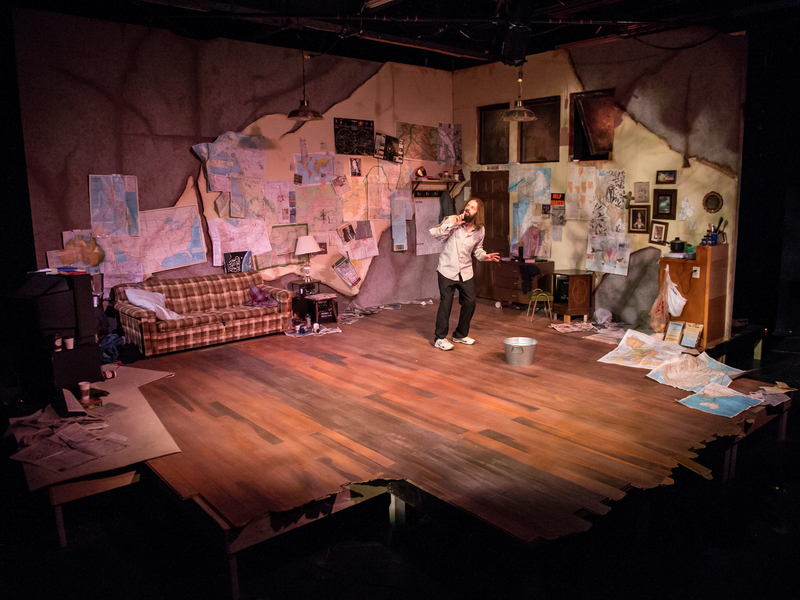 Jasper starts out pitiable as he bursts into the room at the play’s outset, manic and distressed, pacing in frantic circles around a room that’s as disordered as his mind. Crumpled old maps line the walls, assorted trash has collected around the edges, a hole in the ceiling drips an erratic stream of water into a metal bucket, and from the dirty windows – too high to see out of except when standing on a side table – emanate ceaseless city noise pollution overlaid by a thudding, flapping, circling soundscape (by Aaron Macri). That this person is named Jasper is certainly significant – a nod to the Avenue along which you’ll find his real life equivalents. Steve Pirot in The Preacher, the Princess and a Crow. Photo by Marc J Chalifoux. The play seems to want to show, if not sympathy, then some level of understanding and empathy for its sole character. 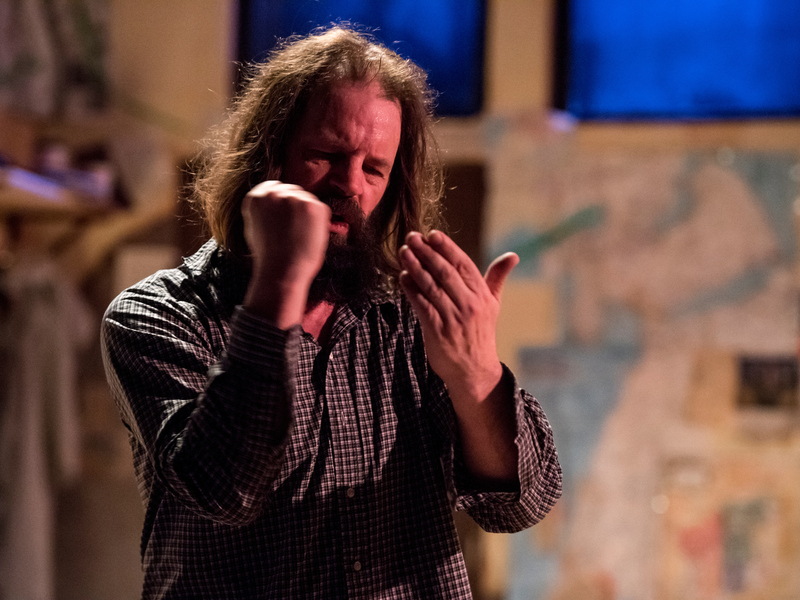 As the play progresses, we are given a series of fragmentary revelations that show Jasper is actually a predator as much as he’s a victim – or at least has the potential to become one. Moeller’s script prevents us from the kneejerk condemnation that would normally follow such a repugnant revelation, however, because we’ve just spent so much time in Jasper’s mind. This is the strength of Moeller’s work: forcing us to face things we’d rather not face, consider things from another’s perspective, walk (or pace, as it were) a mile in their shoes. It’s also a show that will leave you quickly lost if you let your mind wander off at all, as it’s an unrelenting stream of consciousness flow of half sentences and unfinished thoughts, heavy on imagery and metaphor, punctuated by disorienting blood red blasts of light (design by Rae Dunn). You’ll need to listen closely to pick up on all the plot points as they are subtly dropped, as if crumbs from a bird’s beak. Pirot’s uncomfortably intimate performance is aided by an open set design (by Tessa Stamp): a small audience of less than 50 people sits right in front of Jasper’s living room, their backs open to the lobby behind; there’s almost no sense of separation from the world of the stage and that beyond it. We’re supposed to feel as open and vulnerable as Jasper is. I left the show feeling perplexed and a bit angry. I felt like the abrupt finality of the ending was almost too easy a way out, and came about as a hasty climax after a meandering ascent. That’s the point, I’m sure – it’s not like we were supposed to leave the show feeling all warm and fuzzy. I’m just still not sure what to make of it. Pirot’s powerful performance is certainly a sight to behold, but this script didn’t resonate with me as strongly as Moeller’s other works have. Perhaps this is due to that horrid, creeping sense of helplessness that comes on whenever you face such big bogeyman as those presented here. I guess I really want to know if shows like this actually are important, as I somewhat desperately feel they must be – do they actually help us come to an understanding of horrible things? Do they help us progress as a culture? Are we just dwelling and making it worse? Was this a fair portrayal of mental illness? Was it so voyeuristic as to the point of doing more damage than good? Where should we be having these conversations, if not on stage? That I’m asking these questions is a sign that obviously there’s something important going on here. What I needed after this show was to be debriefed, I think. And to that end, there’s a panel discussion addressing mental illness after tonight’s performance. I think it will provide some excellent conversations and I look forward to hearing about what was said.